ANSI C37.23 standard covers the design, manufacture, testing and ratings of the allmetal enclosed bus duct, including cable duct systems. When part of the equipment, it contains the associated equipment such as inter connections, enclosures, switches, supporting structures and disconnecting links. This includes disconnects primarily used with isolated phase duct but can be used with all other types of duct, including cable duct. It can also be accomplished with cable duct but with much more difficulty. The tee arrangement is manufactured of rigid conductors in an enclosure in which the cable duct system is connected to all sides. This requires stress cone kits or cable terminating kits at each cable termination. Such an arrangement requires considerable space and is costly. Hanger supports, wall supports and freestanding floor supports are basically similar for all types of duct. Isolated phase duct, which becomes a requirement for generator feeds due to the normal continuous current rating and minimum BIL level of 110kV, is manufactured from aluminum tube type housings and conductors. The conductors are supported on porcelain, post-type insulators, and the duct system is pre-manufactured in specified lengths depending on the duct system’s physical arrangement. The installing contractor welds the conductors and housing in the field. Isolated phase ducts are used for high ampacity requirements and can be supplied up to 25000A continuous rating without forced-air cooling. Beyond this rating, forced-air cooling is required with all the associated equipment. All accessories such as elbows, tees, the isolating switch and termination to the equipment it feeds are specifically designed for the application and generally come factory assembled, except for termination. Isolated phase duct is quite special compared to the other duct systems described and requires considerably more space. It is also significantly more expensive to purchase and install, but deemed a unique system for specific applications and, in particular, as a generator duct feed. In general, rigid conductor type bus duct length is measured from centre line to centre line, and the equipment to which it is attached, to establish overall duct-length footage. 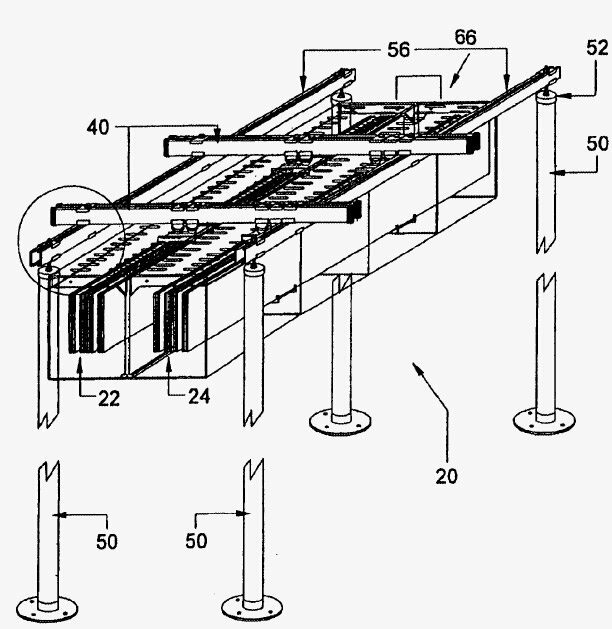 Bar extensions within a termination cubicle are considered part of the termination equipment. For cable duct, the same criteria is used to establish length. The only exception is that 60 inches of duct length must be added to establish overall length dimensions, due to the cable extension leads required at each end. Such cable lead extensions are considered part of the duct length, rather than part of the termination equipment. Non-segregated duct, which includes cable duct, basically has the same continuous current ratings, from 600A to 6000A. Duct of higher ratings is supplied up to 12000A, but this is for special applications requiring special design, manufacturing and installation considerations. Ampacities are normally based on 40°C ambient where conductors have silver-plated joints, and the allowable temperature rise of the conductor is 65°C. Noncurrent carrying parts that can be readily touched are allowed a 40°C rise. Ambient temperature range limits are -30°C to +40°C, and altitude is up to 1000 metres (3300 feet). Other ambient conditions need special consideration and may contribute to derating. Voltage range for these types of duct are basically from above 600V to 34.5kV to ANSI but to 46kV to CSA. In practical terms, the maximum rating is 38kV with a BIL rating of 150kV. 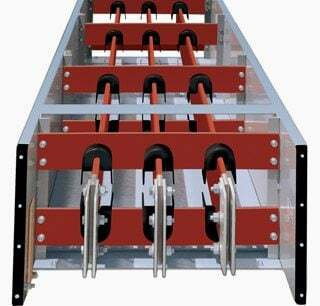 This includes cable duct, even though cable at nominally 38kV can have a higher BIL rating and can certainly have a higher insulating voltage class such as up to 33 per cent insulation on higher voltage ratings. To ANSI standards, corona extinction levels are not specified, but they are to CSA standards and are considered a production type test. Momentary ratings are not specified in the standards but the duct is expected to be suitable and match the momentary rating of the equipment to which it is connected. In general terms, the momentary ratings offered are 82 kA, 100kA or 150kA for 600V ratings; 60kA, 80kA and 100kA for five and 15kV ratings; 6kA and 80kA for 25 and 38kV ratings. The DC bus duct nominal voltage rating is 300 to 3200 volt DC with continuous ratings up to 6000A. Isolated phase duct continuous ratings go from 1200 to 24000A (self-cooled) although tests have been conducted to 25000A for self-cooled current ratings. Voltage ratings are 24.5, 29.5 and 34.5kV with corresponding BIL ratings of 110, 125 and 150kV for direct generator connections. Other than generator connection, voltage levels are 15.5, 25.8 and 38kV with corresponding BIL ratings of 110, 125, and 150kV. I am an author of electrical textbook for Delmar Publishers in Albany, NY. I am in the process of revising a textbook titled, “Electrical Wiring Industrial”. In this revision the book is being changed from single color to full color. I am trying to find replacement photos for the existing black and white photos. I saw a color photo of a bus duct on your wedsite and would like to have a copy of that photo for publication if possible. If you can supply that photo I will have the publisher contact you for the proper permission for publication. Thank you for your time and consideration. How to design a CSA or UL891, 600V, 1200A, 30kAIC bus bar with support. From your point of view a breaker 1200A MCB is better to install in vertical or horizontal position.